TransGuide is San Antonio's inter-agency Advanced Transportation Management System. When it went online in July 1995, it was the first system of its kind in the nation and it continues to be a leader in Intelligent Transportation Systems (ITS) technology. Now operational on a little over 100 miles of freeway, the system may eventually cover almost 300 miles of freeway in the San Antonio area. Below is a map of TransGuide's current coverage area and planned future expansions. The original 26 mile section consisting of the freeways around downtown went online on July 26th, 1995. The sections on US 281 north of St. Mary's, Loop 410 west of I-10, and I-10 between Fulton and Wurzbach went online in early 1999. The sections on I-10 north of Wurzbach, Loop 1604, and Loop 410 east of I-10 went online in August 1999. 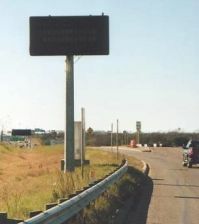 The section on I-35 between New Braunfels Ave. and Walzem went online in March 2000, and the section between Walzem and Starlight Terrace went online in August 2000. The US 90 segment, west of Zarzamora, went online in June 2001. The section on I-37 near Loop 410 went online in May, 2002. The segment on I-35 north of Starlight Terrace and on Loop 1604 west of I-10 was completed in April 2003. The section on US 281 from Basse to Nakoma and on Loop 410 from Ingram to Culebra were completed in 2009. Coverage of US 281 north of Nakoma to Winding Way was completed in 2012. The section on Loop 1604 from Braun to Culebra went online in mid 2016. 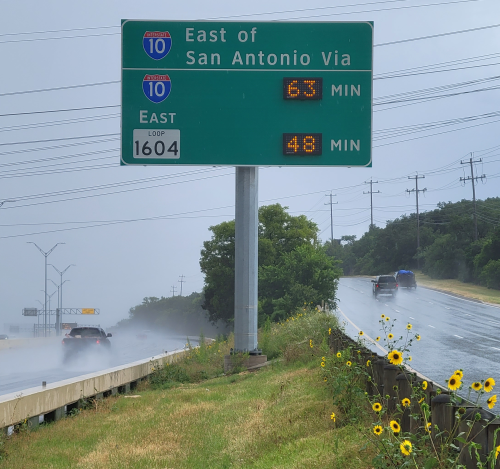 TransGuide cameras have also been installed at several locations outside of the fully-instrumented sections including at SH 151 and Loop 410, I-10 East and Loop 1604. I-35 South and Loop 1604, and several locations on Loop 410 South between I-35 and I-37, Loop 1604 North between I-10 and US 281, and US 90 between Loop 1604 and SH 211. In 2006, TransGuide was designated as the central TxDOT unit to handle statewide Amber/Silver Alerts and other emergency alerts. In 2008 in coordination with TxDOT's Austin district, ITS coverage was extended to the entire I-35/San Antonio-Austin corridor. TransGuide monitors the section from the Bexar County line to the Comal/Hays County line. In November 2009, TransGuide upgraded their website and internal computer systems and announced a maintenance program to clear a backlog of deferred repairs and upgrades to field equipment. Funding shortages over the past decade have delayed expansion plans for the system and resulted in a substantial backlog deferred maintenance. Engineers estimate the maintenance funding should be $7 million a year, but TransGuide has been receiving less than $1 million for maintenance and roughly $1 million for improvements. This funding shortage resulted in officials deciding to permanently turn-off the system's lane control signals and frontage road dynamic message signs (DMSs) in 2009. Engineers are hoping to soon revive the lane control signals at major interchanges. In 2017, DMSs were installed along I-10 between San Antonio and Ozona. The system is currently being expanded into new areas in conjunction with major freeway construction projects. These are along US 281 north of Loop 1604, I-10 from Camp Bullis to Leon Springs, Loop 410 from Ingram to US 90 West, and Loop 1604 from SH 151 to US 90 West. There are plans to expand the system in 2019 to existing sections of Loop 1604 between I-10 and I-35 and US 281 from Nakoma to Loop 1604 as well as in conjunction with the further expansion of US 281 north of Stone Oak. A project to construct an Advanced Traveler Information System (ATIS) will begin in mid 2018. This project will include the installation of 17 travel time comparison (TTC) signs at major decision points citywide, 40 additional Bluetooth sensors to improve travel time calculations, and new DMSs and cameras on the South and East sides of town. The purpose of this system will be to give motorists information on the fastest route to take through (or around) the city. More details on this system are below. The TOC is located in the southwest corner of the I-10/Loop 410 interchange on the Northwest Side. In addition to TxDOT, the San Antonio Police Department and VIA Metropolitan Transit have dispatchers co-located in the TOC. This allows seamless coordination with these agencies during major traffic incidents. 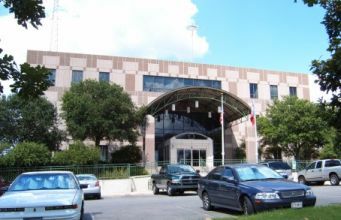 In 2009, the City of San Antonio established their own TOC in the TransGuide building from which they monitor traffic on major arteries and manage the operation of the city's more than 1,400 traffic signals. Currently, COSA's TOC is separate from TxDOT's, but plans are in the works to combine the two in order to improve coordination between them. DMSs display text-based messages alerting drivers to incidents or congestion ahead or on an intersecting freeway. The TransGuide system employs both mainlane and frontage road (entrance ramp) DMSs; however, due to maintenance funding shortages, frontage road DMSs have been deactivated and there are no plans currently to restore them. Lane control signals (LCSs) placed over each lane give motorists information about the status of that lane downstream. LCSs have been a part of TransGuide since it began; however, due to severe maintenance funding shortages, the cost to maintain and operate them was unsustainable and they were switched-off in late 2009 and have since been removed from some areas. However, plans are in the works for a partial restoration of the LCS system, primarily at major interchanges. State law requires motorists to obey LCS signals. A survey in 2007 showed about an 80% compliance rate with LCS and DMS messages. TransGuide originally used conventional in-pavement induction-loop traffic detectors spaced at half-mile intervals in each lane to monitor traffic flow in order to detect slow-downs and associated incidents. Over the past decade or so, other traffic monitoring technologies have been developed including transponder tags, video/machine vision (VIVDS), acoustic detectors, side-fire radar, and Bluetooth tracking, all of which have been implemented at various times by TransGuide. Today, side-fire radar is the main technology employed along with some Bluetooth tracking in the I-35 corridor (currently being expanded citywide.) However, due to funding shortages, maintenance of the traffic sensors has been a lower priority than cameras and DMSs, so most corridors no longer have reliable comprehensive passive traffic monitoring. If funding is increased, restoration of this capability is a priority. In the meantime, the remaining detectors are used along with 911 reports and cameras to locate congestion and incidents. TransGuide employs more than 200 closed-circuit video cameras along the city's freeway system so that officials can view and identify incidents. These cameras offer full pan/tilt and zoom control. These cameras are not used for traffic enforcement and video is not recorded. 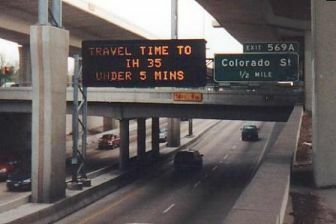 In conjunction with the implementation of an Advanced Traveler Information System (see below), 17 travel time comparison signs like the one shown below will be installed at various "decision points" around the freeway system. These will show the travel times through the city or section of the city on two different routes so that drivers can decide which route to use. Similar signs are in use elsewhere in the state. These signs differ from the travel times currently shown on existing DMSs in that they are dedicated to this purpose and show comparisons of travel times on two routes instead of "inline" travel times for the freeway you are on. Advanced Traveler Information System: A project to install 17 Travel Time Comparison (TTC) signs at major decision points citywide will begin in mid 2018. This project will also add 40 additional Bluetooth sensors to improve travel time calculations and new DMSs and cameras on the South and East sides of town. This system will give motorists information so they can make informed decisions on the best route to take through (or around) the city. 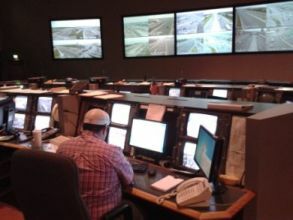 Interregional communication: With ITS systems in most of Texas' major metro areas, TxDOT has started connecting these islands of information together to improve traffic management between cities. The San Antonio/Austin corridor was the first such project. Colocation of COSA TOC: Moving the COSA TOC to the main TransGuide operations floor will result in improved coordination between TransGuide and the City of San Antonio's traffic operations center and facilitate better response during incidents and emergencies. This project is planned for 2019. Restoration of lane control signals: The LCS system was switched-off in late 2009 due to a lack of maintenance funding. Over the next few years, some LCS gantries will resume operation, mainly in the vicinity of major interchanges. Restoration of traffic sensors: Like the LCS system, funding shortages have resulted in the loss of numerous traffic sensor locations. This has reduced the ability of TransGuide to monitor traffic flow along many corridors. If funding levels improve, restoration of this equipment is a high priority. What's the point of TransGuide? All it ever tells me about is congestion that I see everyday and already know about. Yes, it's true that many TransGuide messages are about areas of chronic or recurring congestion that are familiar and well-known to commuters along those routes. However, these congestion reports are useful to people who are not familiar with that road (e.g. truckers and tourists passing through, local residents who don't usually travel that route, etc.) and are also useful as reminders to regulars to be cautious as they approach the congestion. Studies have shown that these warnings improve the traffic flow and safety in the areas where they are used. TransGuide's original intent, and the area where it really provides benefits, is reporting on incidents that cause unusual or severe congestion, and providing those reports in a timely manner to allow motorists to take alternate routes. Also, TransGuide can often detect such incidents before they are even reported by phone and, even when an accident is reported by phone, TransGuide is useful in determining the precise location of the incident as telephoned reports are often vague or inaccurate in this regard. Furthermore, TransGuide's operators can determine the full extent of the incident to ensure that the proper assistance is dispatched immediately. These factors combine to mean that TransGuide saves lives and helps clear incidents faster. What's the point of the travel times on TransGuide signs? I know how long it takes to get where I'm going. The travel times shown on TransGuide signs are computed every minute based on real-time traffic conditions. While the times they show during periods without congestion may seem pointless to those who travel the road often, they do serve the purpose of providing regular travelers of the road with a "baseline" travel time for a route. Then, when the road is congested and travel times increase correspondingly, travelers familiar with that "baseline" travel time can judge the severity of the downstream congestion and determine whether or not to use an alternate route. I still think TransGuide is a waste of money. Why don't they use the money spent on TransGuide building new highway lanes? have to manage what you have. That's the function of TransGuide, not to mention the previously-mentioned benefits to safety. All-in-all, ITS systems provide a high return-on-investment.